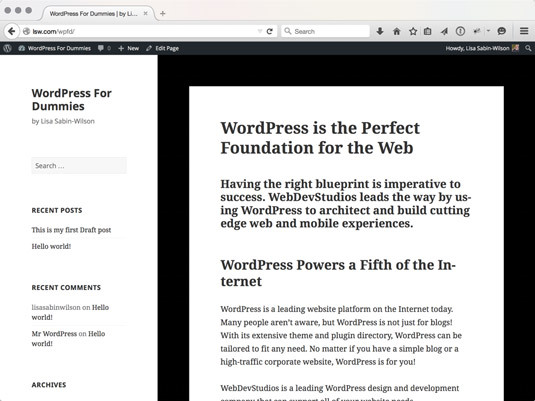 Many WordPress themes use images to add nice touches to the design. Typically, you add these images to the images directory inside the theme. Just as a parent theme may refer to images in its style.css file, your child themes can have their own images directory. The following are examples of how these images can be used. Create an images directory inside the child theme’s directory /wp-content/themes/twentyfifteen-child/images. Add an image to the directory. For this example, add the body-bg.png image. With a quick refresh of the site, it now has a new background. You can see how the background has changed from plain white to solid black. The Twenty Fifteen Child theme after editing the background image. Child theme images are acceptable for most purposes. You can add your own images to the child theme even if the image doesn’t exist in the parent theme folder — and you can accomplish that without changing the parent theme at all. In the footer of the Twenty Fifteen theme, a WordPress logo was added to the left of the phrase “Proudly powered by WordPress.” The logo does not appear in the footer of the Twenty Fifteen theme by default; adding it via the CSS in the child theme makes it happen, though! 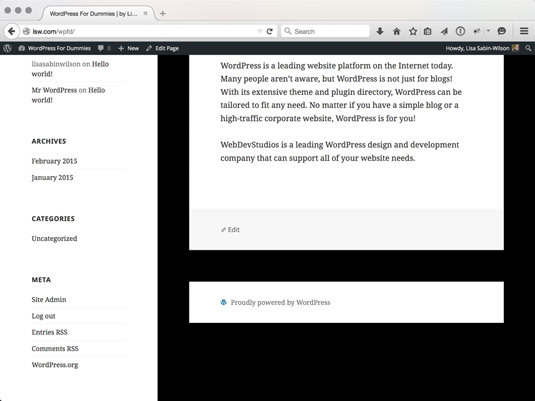 The WordPress logo in the Twenty Fifteen footer.